A story about taking control of your career. Mark is drowning. He hates his job, but can’t escape. His performance is declining and his attitude is becoming toxic. His problems at work are destroying his relationships with his wife, daughter, and friends. Then, a friend introduces him to Steve, a professional coach. Can Steve help Mark conquer his work challenges? Can Mark learn to “swim in quicksand”? 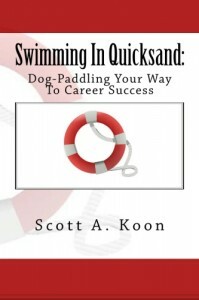 This parable not only tells Mark’s story but introduces proven strategies anyone can use to dog-paddle their way to success. Read More Can I use once for conception on ovulation day ?